For libertarians today, The Hunger Games is proving to be this decade's version of The Matrix -- a wildly popular pop-culture phenomenon that reflects the ongoing libertarian battle against repression and tyranny. A crucial element in the success of the Hunger Games films is the acting ability of wunderkind superstar and recent Oscar-winner Jennifer Lawrence, who is the center of the films. 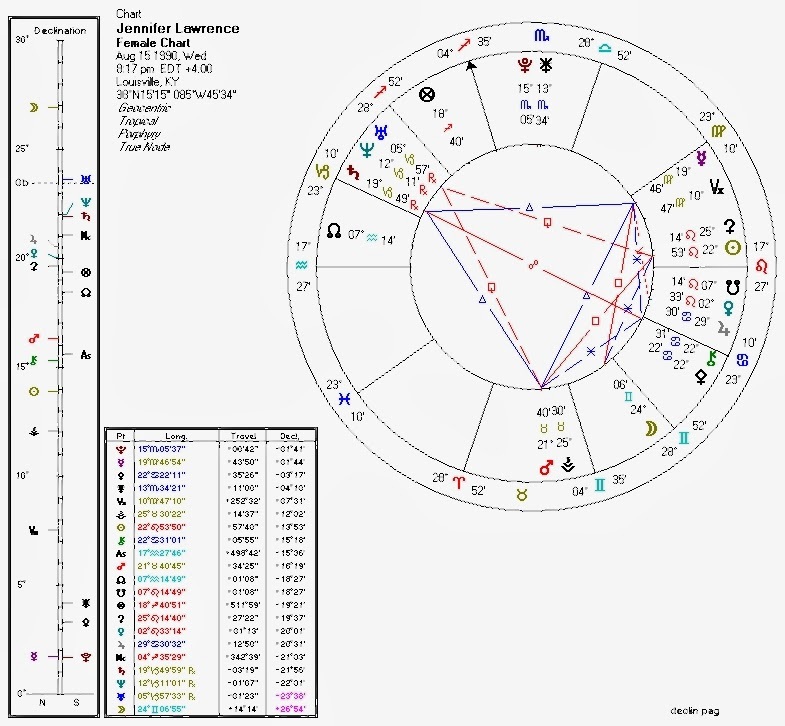 While Lawrence does not seem to be openly political (one of her many refreshing qualities), her astrological chart nevertheless sheds light on her suitability for portraying an essentially libertarian heroine (among other roles), as well as her personal traits and considerable talents. Pallas is sextile Mercury, closely semi-sextile the Sun, and quindecile the North Node: Pallas here is in aspect to all three factors that strengthen her libertarian/ethical aspect. The wide trine from Pluto is probably no match for these factors. Should Lawrence ever become seriously interested in political ideology, we'll see her in all likelihood on the side of peace and personal freedom rather than central authority and state control. This placement is an excellent reflection of the Katniss character she portrays in film, and helps account for the "tomboy" factor in this and other Lawrence characters (trans-gender expression is a common Pallas side-effect). It also may reflect Lawrence's acute awareness of the potential social consequences of her decisions as a top-rank star and role-model for the young. Her strong Pallas, representing strategic thinking, might also help keep her out of the sorts of excesses and troubles typical of Hollywood denizens. Pallas in Cancer, sextile Mercury which rules the Moon: Pallas-Moon is a fighter's signature. Lawrence does play quite a few "warrior"-type characters, as well as displaying a playful sort of pugnacity off-screen. Again, a good match for Katniss, Mystique, and her characters in Winter's Bone and The Burning Plain... all of whom show proficiency with fighting and/or weapons. Pallas-Venus conjunction: in women, often correlated with compelling beauty and/or charisma. This may also bode well for the financial success of possible future entrepreneurial ventures. Pallas-Chiron conjunction (very close) in Cancer opposite Ascendant co-ruler Saturn and sextile Mercury: By all accounts, Lawrence's family life is healthy and functional -- and I see no serious family problems in the chart. Onscreen, however, she compellingly portrays emotionally wounded characters from broken homes. In "real life", she displays a knack for strategically using (Pallas) her foibles and idiosyncrasies (Chiron) to charm the public. I suspect Pallas-Chiron in these aspects has something to do with all of this. Incidentally, Lawrence has stated that she once considered a career in medicine. Pallas quindecile Uranus and opposite Saturn (ruler of Uranus): Pallas-Uranus, according to my research, is a possible comedian's aspect. See her in "American Hustle" or in a candid YouTube video for evidence. The Pallas-Saturn aspect seems to show up in the charts of architects and persons with a genius for structure. This opposition triggers, by conjunction, an artistic Pallas-Neptune connection. Should Lawrence follow through on her desire to be a film director, we might see a career resembling that of (fellow Palladian personality and actor/director) Clint Eastwood. Venus on this chart is conjunct the South Node, a very typical Leftist economic indicator. Venus with Neptune and/or the South Node is also ubiquitous, if not required, for creative artists -- it's no accident that most artistic types tend towards Left-wing economics. On this chart, however, the Pallas placement is possibly strong enough (and the Venus/South-Node conjunction possibly weak enough) to allow the creative aesthetic sense to come through without the economic effects. Nevertheless, this aspect seems to have manifested in a number of films so far, in which she portrays economically impoverished characters (Winter's Bone, X-Men: First Class, the Hunger Games). Sun and Venus in Leo, in the Seventh and Sixth Houses: Noel Tyl associates the Seventh House with public involvement -- in this light the Sun in Leo in this house is perfect for a film star. Venus in Leo also suggests a high capacity for creative self-expression: in the Sixth it also suggests a real work ethic. Venus conjunct Jupiter: another indicator (with Venus-Pallas) of outsized (Jupiter) charm (Venus). This also helps account for her exaggerated (Jupiter) financial success (Venus). The Sixth House placement echoes the fact that said success is directly related to her work ethic. The Moon in Gemini and her ruler Mercury are square and both sesquiquadrate the North Node. The heavy Moon-Mercury involvement reflects her proven ability to clearly communicate emotion. The North Node involvement suggests both a deepening of this ability over time as well as increasing interest in the Moon-ruled issues of home, family, and culture. In the charts of politically active persons this would also translate into a tendency toward cultural conservatism -- like the Venus placement in this chart this tendency might be somewhat obviated by strong Pallas signature. It's interesting and apropos that she has played many characters for whom family/tribe are central, and who often care (Moon) for their siblings (Mercury). Sun-Mars square, both sesquiquadrate Uranus, co-ruler of the Ascendant: hyperactivity, unpredictable/unusual behavior, and tendency towards accidents -- plenty of these in Lawrence's "real life" off the screen. Pluto-Sun-Mars T-Square: the aspect from Pluto to the tight Sun-Mars square is weak, and so probably not crucial. Lawrence's on-screen characters often display bursts of destructive anger, but these tend to be incidental rather than central to those characters. Also, Pluto might sometimes behave as an unaspected planet here. In the Ninth House of publicity this might express in the form of Plutonian screen roles (involving death, sexual energy, betrayal, etc.). Mercury-Saturn-Mars Grand Trine: forceful (Mars) and authoritative (Saturn) communication ability (Mercury). This is obscured a bit by the Uranian unpredictability and humor, but comes out onscreen and perhaps in her slightly gritty vocal timbre. Mercury contraparallel Pluto: willingness to discuss taboo subjects, and a bit of a "potty-mouth". Possibly power-struggles with siblings -- in this case, she's probably winning right now. Neptune conjunct and at the midpoint of Saturn and Uranus, both co-rulers of the Ascendant: Many great artists have a prominent Neptune which both imparts to them great creative energies but also wreaks havoc in their personal lives. Lawrence's configuration may suggest an ability to "project" Neptune's magic and glamour through action (the Ascendant) but remain personally aloof from Neptune's more deleterious effects (Neptune doesn't affect much else on the chart). The Ascendant in Aquarius (along with aforementioned aspects) probably corresponds with social consciousness as well as her ability to deliver surprising and intriguing performances. Sagittarius MC: Astro-guru Frank Clifford associates the MC sign of an actor with the type of character than actor most often portrays. Sagittarius might be consistent with Lawrence's "political activist" characters including Katniss and Mystique. While examining the chart of a not-overtly-political actor is somewhat tangential to this blog, Lawrence is an unusually good example of different manifestations of Pallas -- the planet which forms most of the basis for the blog. That, and I'm a fan.